Ever since the Panic of 1869, that occurred because of a manipulation attempt in a gold market by a couple of financiers, the day after Thanksgiving is considered to be “Black Friday”. The roots of the story are telling that the name of the event occurred when the manipulation was failed because of the release a large amount of gold, which caused prices to drop for 18%. This was a huge drop and since then the sales before Christmas holidays are called “Black Friday”. If you’re a marketer, an online store owner, you should be well-prepared for the Black Friday beforehand. 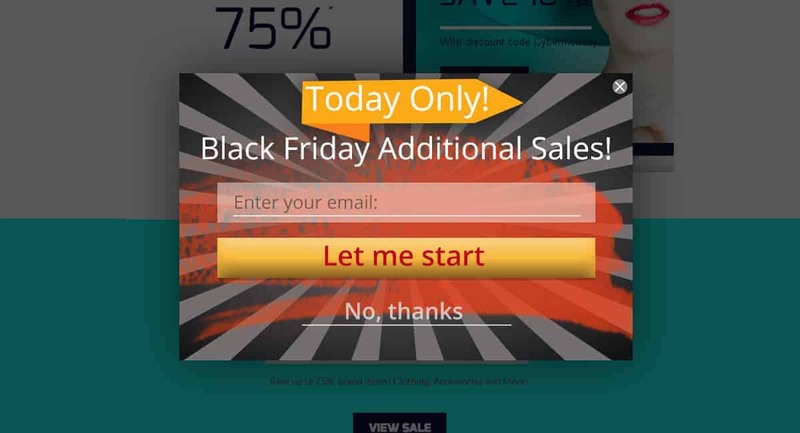 Draw a tactical plan of your campaign for Black Friday with online popups, to inform your shoppers about the cool sales you have prepared for them. All the shoppers around the world are waiting for that one day in the year to get drown in the chaos of crazy sales. No matter in real shops or online stores, all the market is following the rule of the Black Friday. This is the period when the market owners are getting most of their income. The campaign itself should consist of beautifully and cleverly designed ads that will catch your shoppers attentions and push them for vast shopping on your store. The inseparable part of any marketing campaign is the announcement part of this whole process. As a market owner, you should inform your shoppers about the upcoming sales event beforehand. Make sure you’re properly prepared for the campaign. The point is about the attraction of the shoppers. You can attract any shopper with a properly selected image for your campaign. Don’t save your time on the creation of a perfect image to fit your campaign and entice the shoppers from the first sight. The image can be a funny one, or a stylish one, this depends on your website style. The key point for any case is hitting the point of the subject. Something connected to the sales and something that will accidentally enchant the view and move the interest to read the message on it. Concerning the message, think of a text that will attract the users at once and convince them to check your offer. Lastly, the best way to show your already complete ad is implementing it in a popup that will strike on your site informing all your site visitors about the upcoming sales. Time limited offers are always the best working ones. People quickly get in a rush when there’s a time limitation on some offer. This is exactly what you should encounter when you’re running your sales campaign for Black Friday. Move your shoppers to make quicker decisions and go ahead for massive shopping not wasting any time. Time limitation will greatly help you to have the desired results, that’s for sure. Present you offer in the best attractive way to motivate the shoppers to make as much shopping as they are able to in a short time period. This is the normal reaction of people when they are put in time limitations. They get in a mess and do their best to manage to make as many purchases as they are able to, till the sales are available. This is why you should show your offer in a popup accompanied with a countdown form that will estimate the availability of your sales offer. 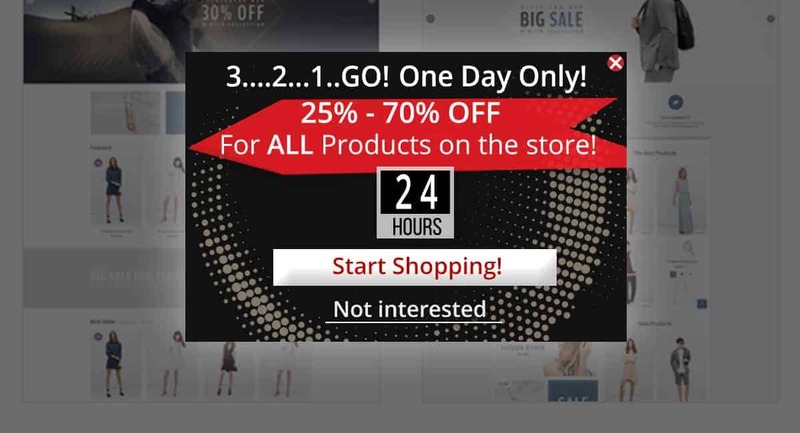 Implement this offer in a week before the start of the sales, so the shoppers will see it every day on your site and do not forget about “that day”. A good marketer should always have something special for his shoppers to propose. Making them feel special, and bribing them in many possible ways, you can have the best sales ever. Black Friday sales are offered on almost every store out there. 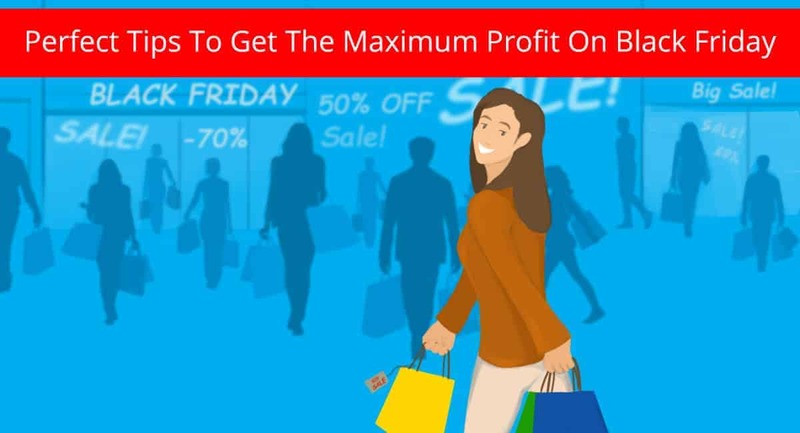 You should think about ways to attract users and make them do the shopping right on your store. Of course, you have competitors, and this is vital for you to have something distinct to offer the customers, so they can choose your store. Use the special offers cleverly enough and you can get 2 profits at the same time. Offer sales for subscription and you’ll kill two birds with one stone. You’ll sell more stuff on your store and will expand your subscribers list. The point is to make the offer as enticing as possible, so it will cling the shopper and push them to the actions you desired. Offer additional “special” sales for your customers, which they will receive when they subscribe to your list. Make them hurry up and mention that the offer is valid for one day only, so they won’t waste any time and hurry not to lose the chance of the “special, additional” sales. And what you need to make the full package of this campaign is showing this subscription sales offer in an enticingly constructed Subscription popup to increase the effect of your offer and get the maximal results. Sometimes it’s very important to keep the equality between the customers. So everyone will have the same options as the others do. Black Friday is the case when everyone expecting great sales to make more shopping with lower prices. So, just be generous and provide equally profitable discounts for all your shoppers. Keep all of these points in your mind and pack them all in a beautifully organized popup. 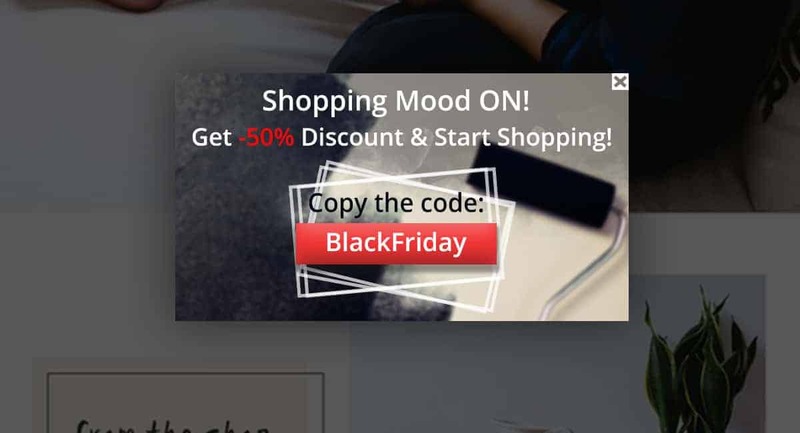 Include an attractive image, connected to the idea of Black Friday shopping, so the shoppers will understand the point of your ad at once. 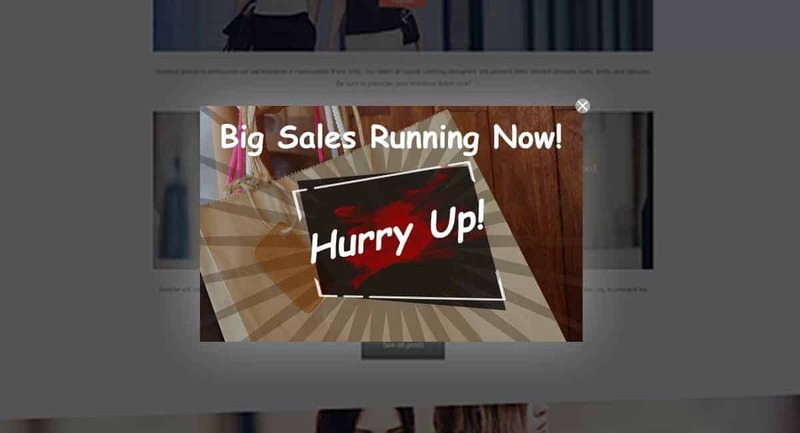 Add an enticing title to your promotion in the popup, along with the image, to double the effect of attractiveness. And, to complete the total pack of this “profit box”, include a button that will let the users copy the coupon code to have the desired discount for shopping. This is a very convenient way of providing sales to the shoppers, as the only thing they need to do is copying the code and implementing it during purchases on your store. 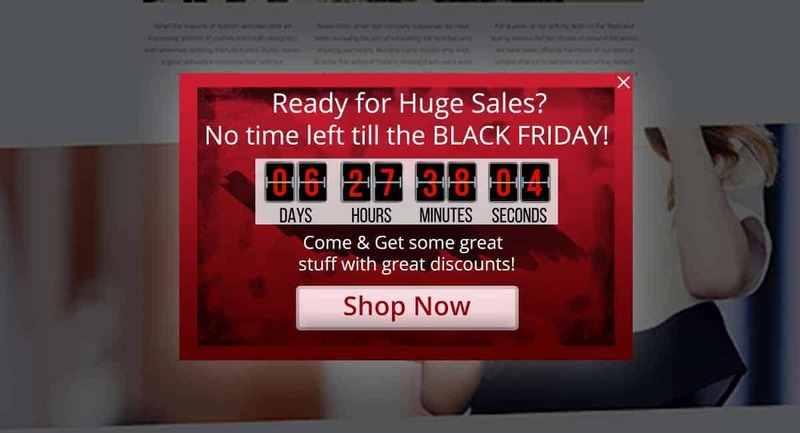 Besides the idea of presenting your offers in the best attractive ways, you should encounter one more, no less important point when running your Black Friday campaign. It’s all about the right of choice. Be sure you’re not pressuring your shoppers with your offers. No matter how profitable and enticing they can be for your shoppers, they should always have choice. Even if there’s hardly someone who’ll skip the offer of getting big discounts for shopping on your store, a tiny “Not interested” button won’t hurt your promotion in no way. This will only give you an additional charm, showing that you care about the choice of your shoppers. Just keep this little point in your mind and proceed to the creation of the coolest popup campaign ever for Black Friday sales on your store. Motivate and intrigue the shoppers with an interesting title, like “3….2…1..GO!”. This can be a perfect start for your campaign, it’s both, funny and motivating. And again, it’s all about time limitations. That’s what’s pushing the shoppers for more purchases. They get in the enticing mess of shopping in hurry, bringing you the profit you could ever dream of. Now you’re ready for the perfect campaign strategy to get the best profit for Black Friday! Go ahead and start the most profitable popup marketing on your store and you’ll have your sales boosted. Make proposals that will double your profit, getting more shoppers and more subscribers at the same time. Don’t forget about the convenience of the usage on your store. Implement the best tools to ease the job of the shoppers on the store. Provide the discount codes in “copy/paste” options to make the process of discount appliance way easier.